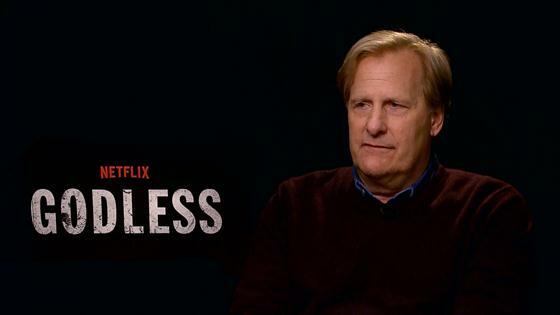 Jeff Daniels Talks Challenging Villain Role in "Godless"
Your next Netflix binge is here! Godless is the streaming service's newest offering, a seven-part miniseries about a former outlaw, his vengeful ex-partner in crime, and a town inhabited by only women. The show is worth a watch for a lot of reasons, and according to star Scoot McNairy, one of those reasons is that it's a great show to watch with your family for the holidays. We don't necessarily agree with this due to some seriously questionable content, but hey, we don't know your family. Another reason to watch is Jeff Daniels in a role we haven't quite seen him play before. "I was looking at the role and I didn't know how to do it," Daniels tells E! News. "Which meant that if I did it, I would be risking failure, so I'm at least challenged that I can't just show up and do what I've done before in something else. That's always a reason to dive into something." Daniels plays Frank Griffin, an evil, menacing outlaw hunting down his greatest enemy and former partner Roy Goode (Jack O'Connell), and he hopes the role will shock people. "That was part of the plan," he says. "This is the first thing I've done on television since Newsroom and Will McAvoy, which is a whole different guy, so I like going from a Newsroom to a Godless. It's why I did Dumb and Dumber way back when, was to drop Dumb and Dumber in the middle of all this drama and Gettysburg and other things, so they're going wait a minute, who is this guy?" And finally, we have to talk about that town full of women. The men of La Belle all died in a mining accident, leaving their wives behind to The women are led by the mayor's widow Agnes, played spectacularly by Merritt Wever. "This isn't a town of women who are these damsels in distress," McNairy, who plays the town sheriff, says. "These are people that are thriving and striving in a very very difficult landscape for their livelihood." Wever thinks the focus on the women of La Belle "opens up the world of westerns a little more," and McNairy says that showing the role of women historically makes it feel a little bit more authentic. The focus on women fighting back for themselves and for their town may feel extremely topical, but Daniels says he can't say creator and director Scott Frank was being prophetic in creating the series. "I think Scott has always felt that the strength of women is undeniable, and he chose to dramatize it, and then Harvey Weinstein and all that stuff happened," Daniels says. "So as far as a champion for the strength of women, I think it's timely." Godless is now streaming on Netflix.